Tai nebe pirma mano kepta airiška sodos duona. Labai seniai esu kepusi tradicinę, paprastą sodos duoną. Tik tada aš ja taip nesidžiaugiau, kaip šita. Labai skani, labai kvapni, šiek tiek saldi duonelė. Be viso to, greitai, lengvai paruošiama be kildinimo ir ilgo minkymo. Nuostabi idėja, puikus skonis, gražus patiekimas ir visa tai - plėšomoje picoje. Skubu pasidalinti šiuo nuostabiu receptu. Skonis puikus, patiekimas ir išvaizda viliojanti, įdomi idėja! Bandykit būtinai! Man siaubingai patiko. Namuose net kilo skandalas dėl šio skanėsto. Chi chi. Būtumėt matę, kaip dukra puolė prie šios picos ir kaip nusiminė, kai tėveliai neleido griebti už viso kepalo. Ašaros, riksmai, pasipiktinimas. Teko ekstremaliomis sąlygomis paskubomis fotografuoti ir tramdyti bei guosti mažąją užsispyrėlę. Chi chi. Minkšta, saldi, marmurinė bananų duona su šokoladu. Labai skani, drėgna, minkšta, saldi ir kvapni bananų duona. 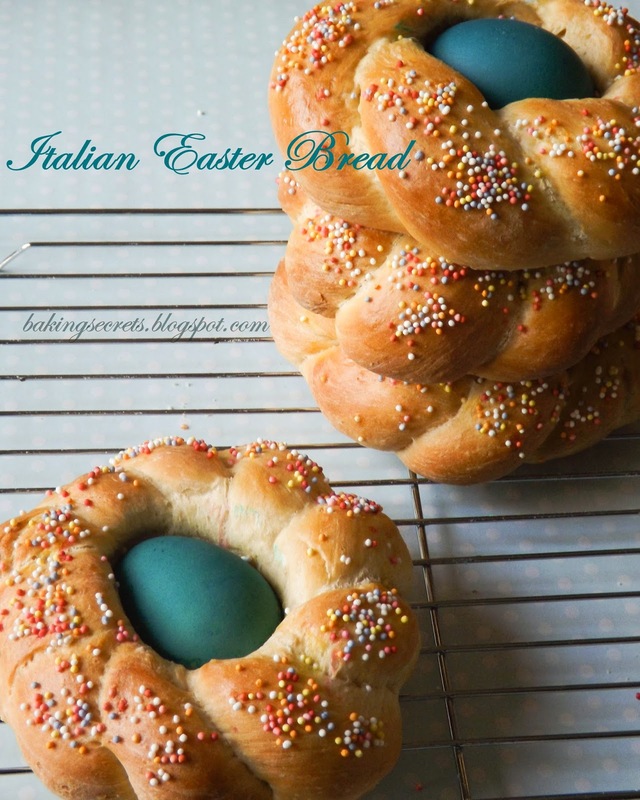 Italian Easter Bread - very light, fluffy, with a delicate sweetness from the sugar and milk. These Italian Easter Breads are very light, fluffy and slightly sweet. Topped with colorful sprinkles and eggs nested in the middle, these breads will impress everyone! 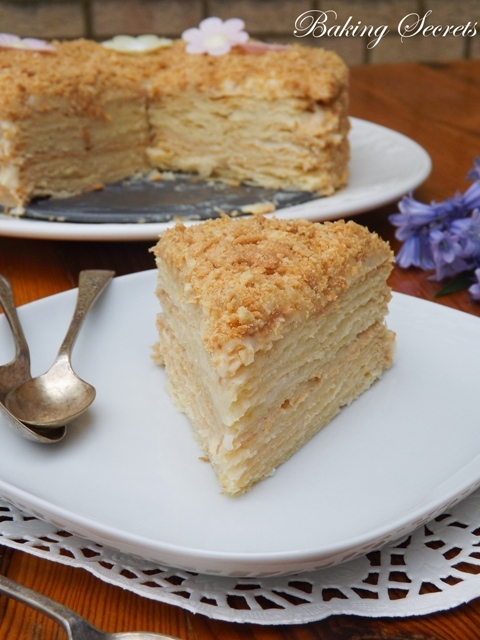 This is one more recipe from golden Paul Hollywood collection. I love his recipes! They are always great and result never let me down. 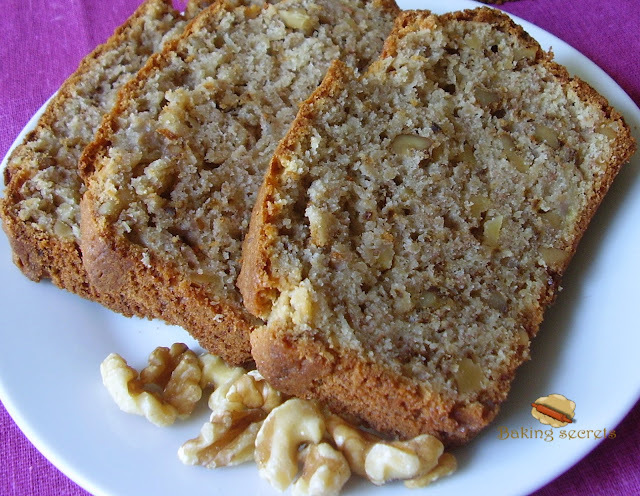 So here it is Banana Bread with Walnuts. 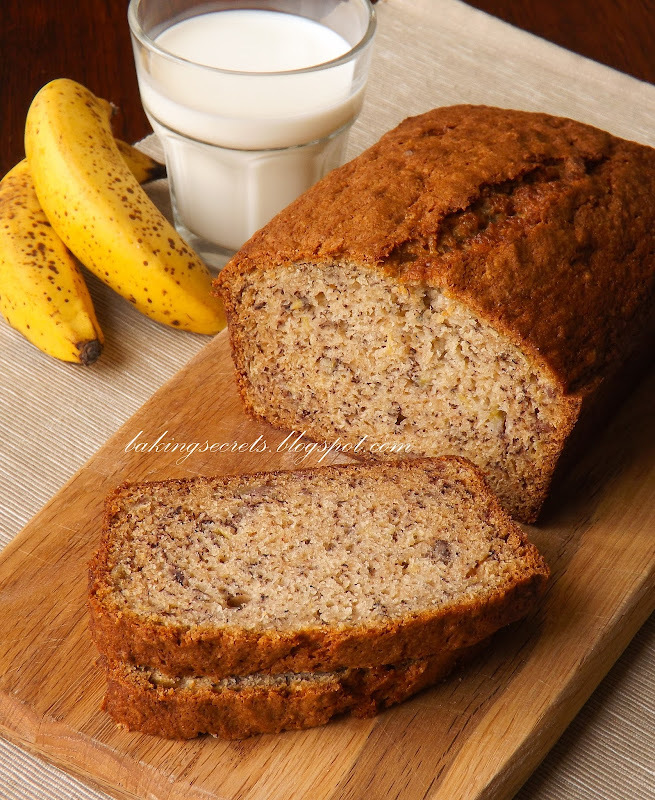 Every baker needs to know good banana bread recipe. 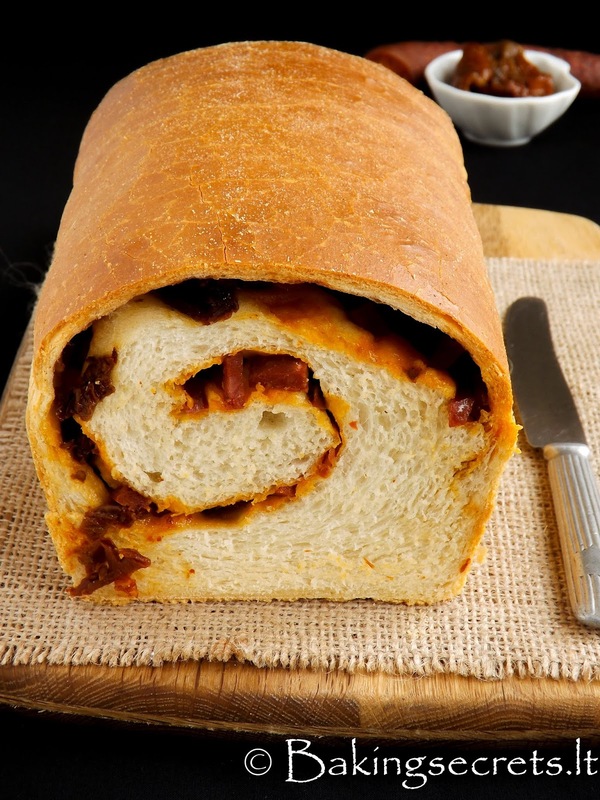 This simple and sustaining loaf is great for packed lunches or picnics. Walnuts give a great taste to the bread. 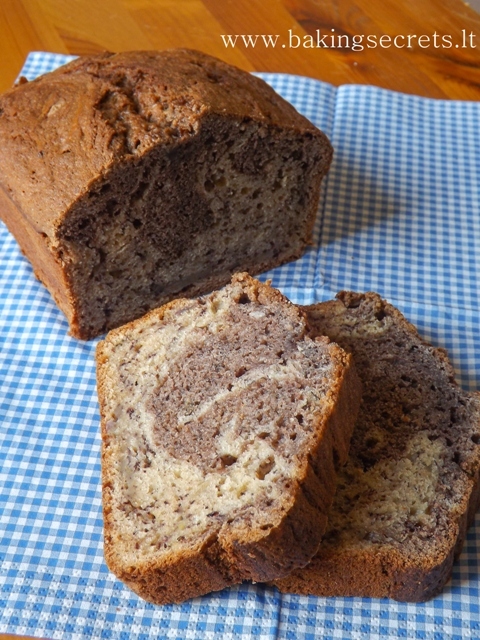 It is rich, full and sweet banana bread! 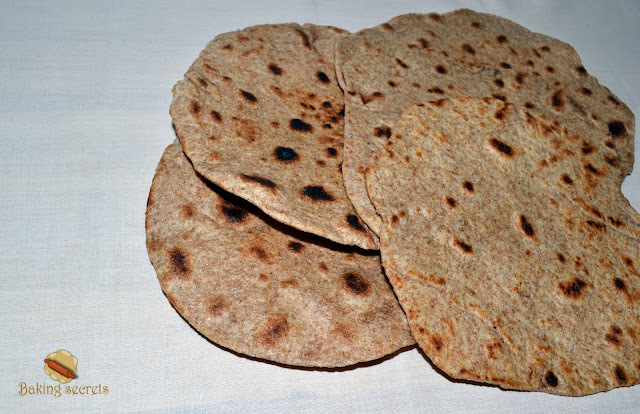 Today in my kitchen Chapatis - Indian flatbreads. 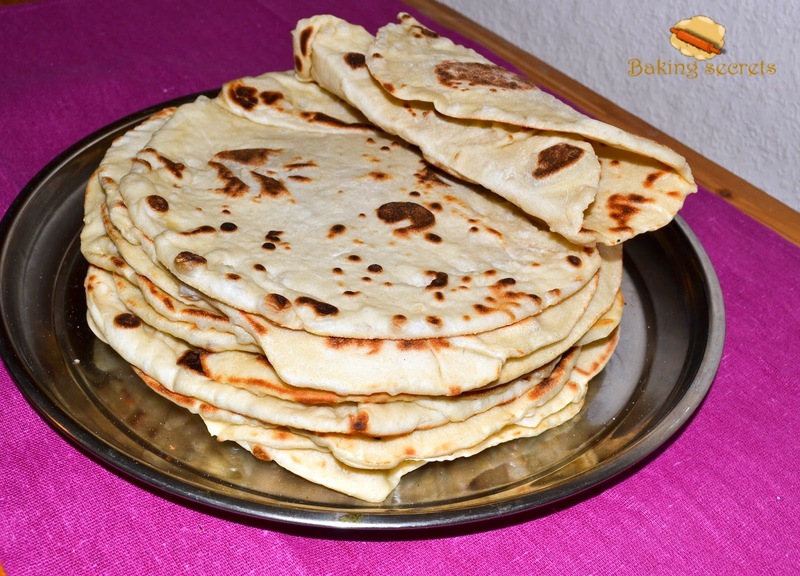 Traditionally, chapatis are baked over an open flame, simply held in the hand. You have to be very quick, turning and moving the dough above the flame without letting it or your hands burn. Indian girls are taught how to do this from a young age and this skill is taken to be the sign of a good cook. Thankfully, chapatis are also very good cooked in a hot frying pan. They are delicious for scooping up almost any curry. It was very easy to work with Chapatis dough, because it wasn't sticky. Nice to feel some Indian style at home. Eigh-strand Plait is my 6th Baking Secret. At first, I thought it would be one of my biggest baking secrets. It seemed to me that it would be very difficult to make. Even when I started the plaint it seemed that something was going wrong, that I would not make anything similar to plait. I was loosing my hope. But still I kept going. And finally, I saw how eight-strand plait was coming out!!!! I was so happy! Like a little child! After this experience making plait became very exciting! I enjoy this process very much! I am very proud of myself that I can make plait now and even eight-strand plait! It is not a piece of cake! Time to time my plait is getting better and more even, but still I need to practise in order to make an ideal eight-strand plait. Do you want to try? 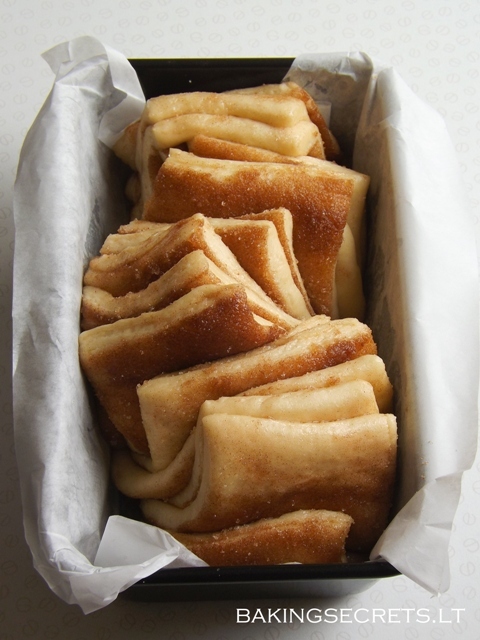 The 5th Baking Secret - Wraps! 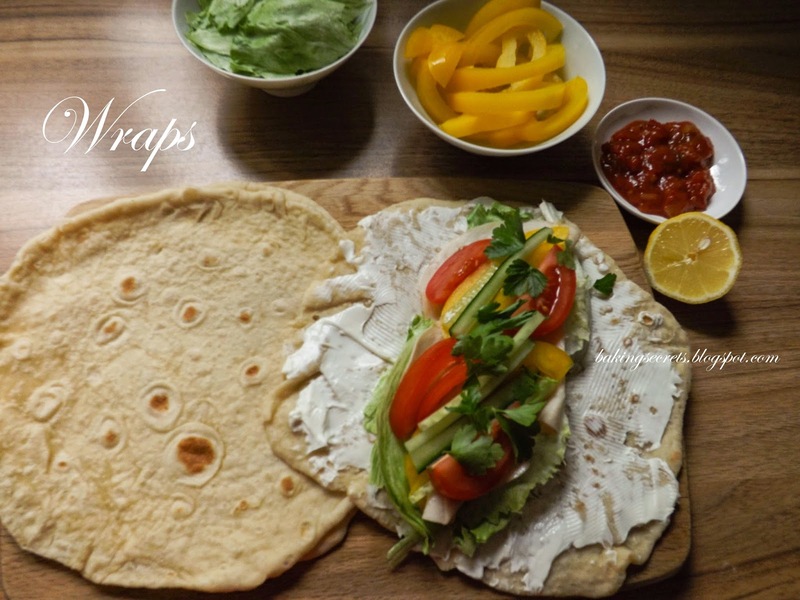 These lovely, simple flatbreads are soft and tender enough to wrap and fold, so you can fill them with all sorts of tasty ingredients. You can serve them unfilled too, just dip into a soup or scoop up a chilli. They are ideal for quick meals, because defrost very quickly. We enjoyed these wraps so much!!! 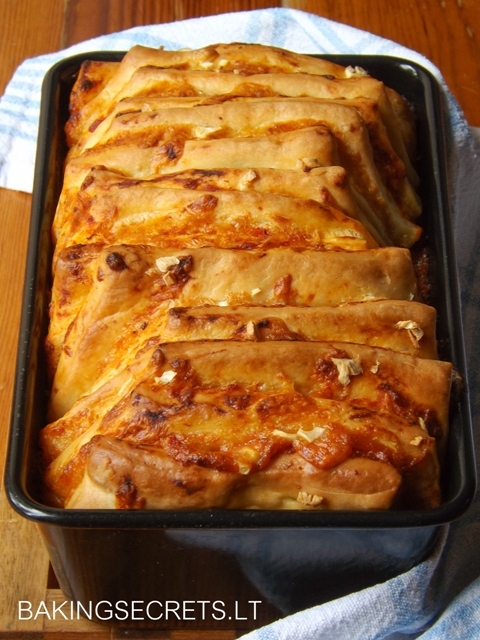 I filled them with chicken, salad, tomatoes, paprika, sweet chilli sauce and majo. So delicious!!! 4th Baking Secret which I learned from Paul Hollywood is Soda Bread. It is the traditional bread of Ireland. This bread is really quick to make, perfect when you want to knock something fast for lunch or supper. 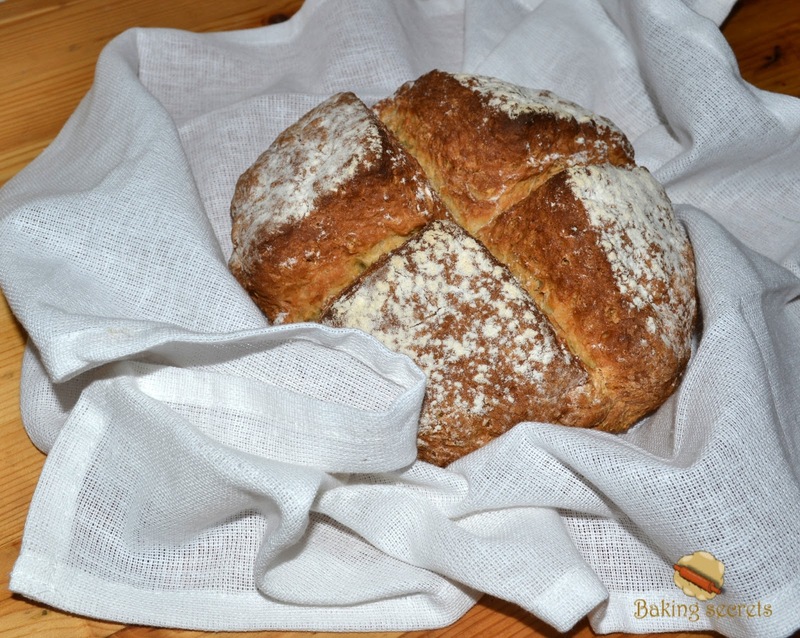 Soda bread is excellent served warm, fresh from the oven and best eaten within a day of baking. I tried to leave it longer, but after a day or two it became very hard and not very tasty. Generally speaking, the taste of the bread is not usual. It tastes to me more like salty pie then usual bread. But taste is undoubted thing! My first baking of this bread was not very successful as I made several mistakes. Fist, I didn't flatten the dough enough and didn't cut deeply through the bread before baking as a result it did not bake normally inside. The second time was more successful! 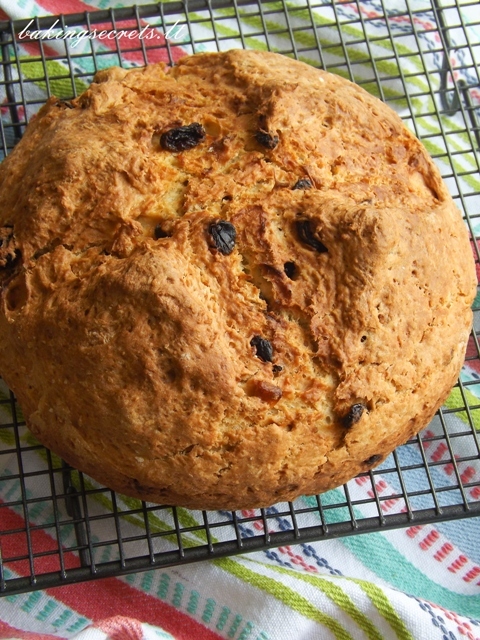 Unfortunately, I didn't fall in love with this Irish Soda Bread. However, it was nice to try! 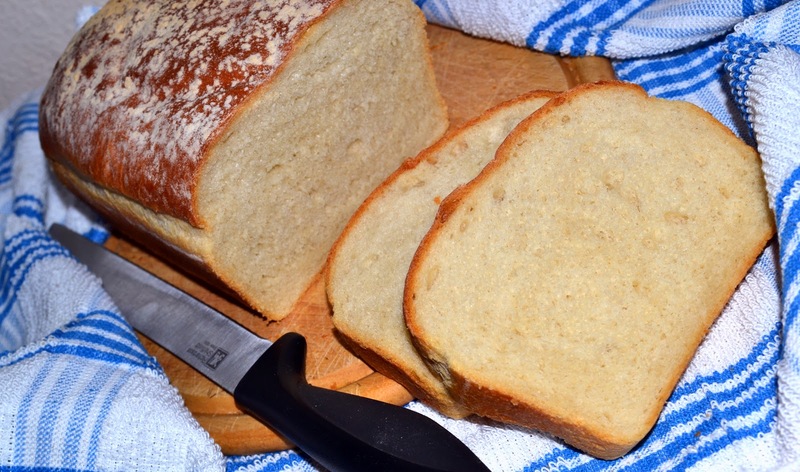 This recipe is the same as Basic White Tin Bread but in a slightly bigger quantity. The loaf is sharped by hand. The cob perhaps is the oldest and most basic of British loaves. The word "cob" is an old word meaning "head". If you slash this bread with a cross on the upper crust, distinguishing if from the cob, like I've tried to do this time, this bread then is called Coburg. In the old days slashing the dough with a cross before baking was believed to let the devil out. So this time my bread baking become even some sort of ritual! But the most exciting thing - I learnt to make cob loaf! It wasn't ыщ difficult as I thought it might be. 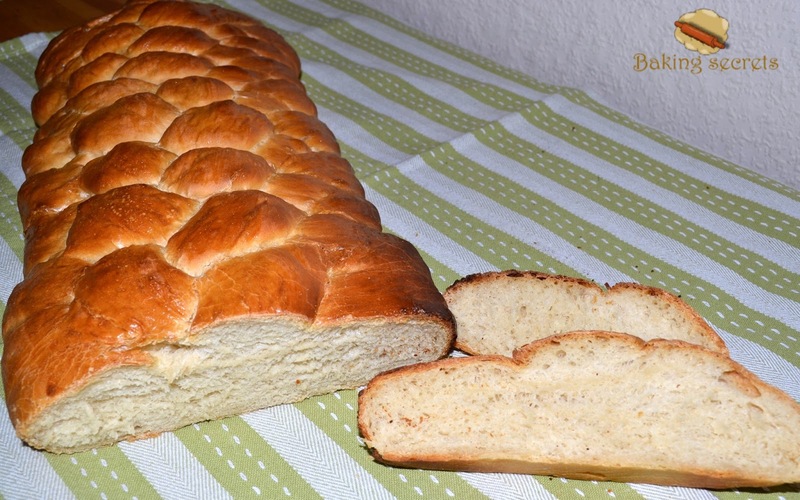 The taste of the bread is simply nice white homemade bread taste. The third baking secret - White Cob Loaf, was revealed! My second baking challange is Wholemeal Tin Bread. 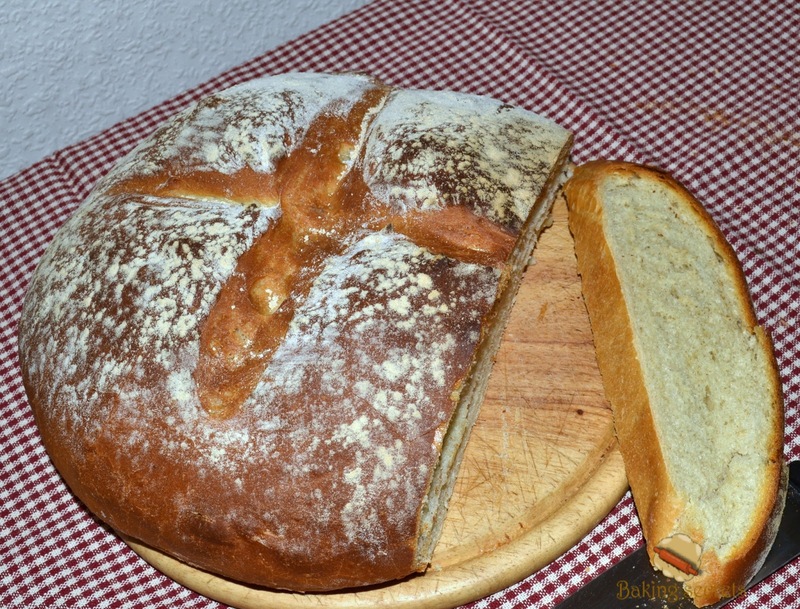 Basically, it is a very similar recipe to Basic White Tin Bread, however this bread contains of strong wholemeal flour and the taste is quite different. This was my second try to master basic breads and it was really good. I noticed the difference between two doughs as wholemeal one is much tougher and easier to work with. It seemed to me like that. Of course, I'm getting better in mixing and kneading breads as these processes become easier and quicker. What about the taste? It is certainly a very nourishing bread, healthy as wholemeal flour retains all the best bits of the wheat kernel and therefore, has a higher fibre and nutrient content. Some people like these kinds of breads, others not very much. I am at the middle of them. I would prefer less wholemeal flour and more strong white flour, as the bread would be lighter. If you try to change wholemeal flour and strong white bread flour proportion, keep in mind that wholemeal flour absorbs more water and you have to change water proportion as well. Nevertheless, the second baking secret Wholemeal Tin Bread was revealed! Now I know how to bake it! Read more, try and you will know also. So. Let's start our baking journey with the basic white tin bread. This recipe will introduce you to the key techniques you'll need for most bread-making. The dough is baked in a tin to give that regular, easy-slicing shape that is ideal for sandwiches and toasting. 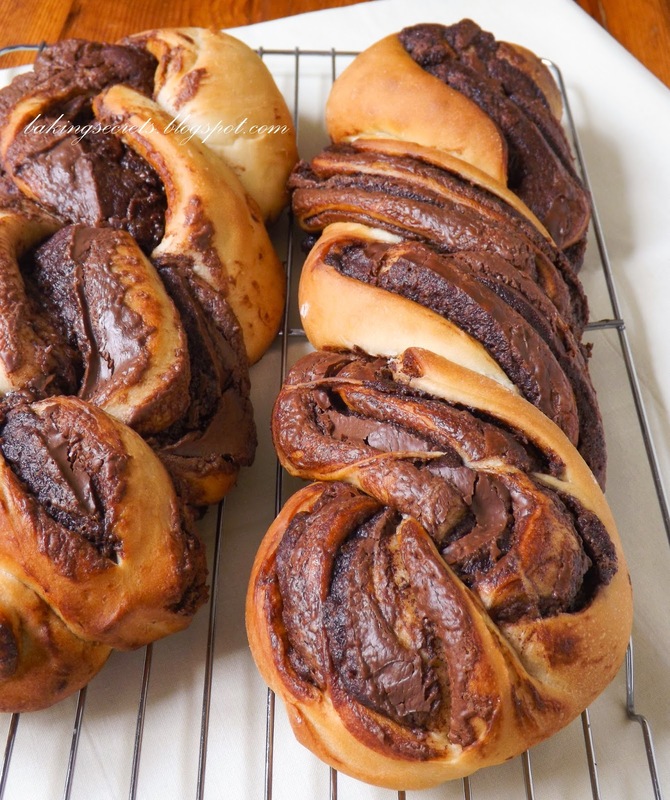 It was my first step to the baking world and I loved it! I've done everything by recipe and the result was amazing. I used to bake bread in my breadmaker for a long time, but compare to this one, this bread is absolutely brilliant. The bread was soft, light, the crust was as it should be. It slices very well, doesn't crumble. I was absolutely suprised with the results. I have never eaten more delicious home-made white bread! So the first baking secret Basic White tin Bread is revealed!